In CSS, what is the difference between default, user and author style sheets? Default style sheets are supplied by the browser vendor. User style sheets are supplied by the user of the browser. Author style sheets are supplied by the author of a webpage. Author: The author specifies style sheets for a source document according to the conventions of the document language. For instance, in HTML, style sheets may be included in the document or linked externally. Default (aka User-agent/Browser) style sheet: First thing, Default style sheet is also known as Browser style sheet Or User-agent style sheet. This is the style sheet which browser applies by Default for every web page which it renders. So if as the author of a web page you don't apply any styling, even then it is not styleless. It still applies the styling details present in the default style sheet installed within the browser. We can assume that it must be containing some styles for all standard HTML tags e.g. <span>, <p>, <h1> etc. This SO post provides great details about how the default style sheets of various browsers look like. But still you see that headers of the table are shown in bold. 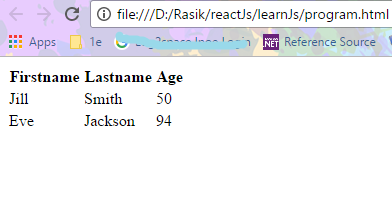 That is coming from browser's default style sheet. User style sheet: Now the second level is user style sheet. Browsers give you the option of extending the browser's default style sheet. For e.g. 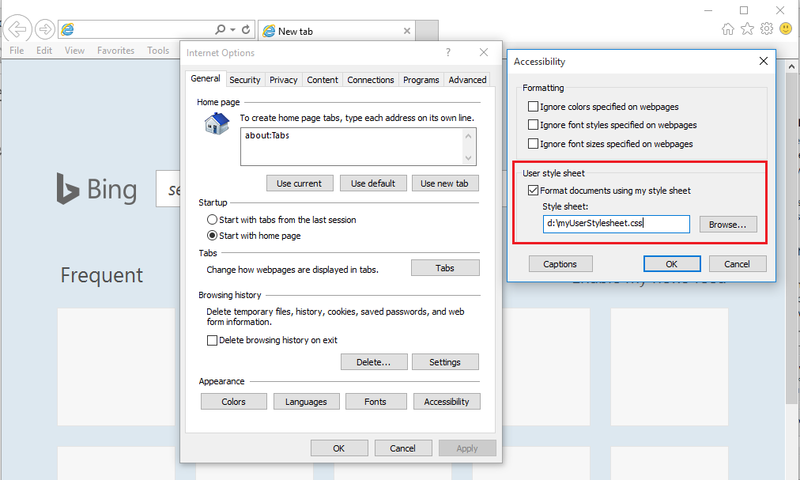 in internet explorer you can go to Tool > Internet Options > General Tab > Accessibility button > Accessibility Window > User style sheet section > "Format documents using my style sheet" check-box. So for the same html tag if I provide a different style in my own style sheet ("D:\myuserstylesheet.css" in this case) then same it will start overriding it. Internal/Embedded : CSS styles defined in <style> tag inside <head> tag of an html page. Note: !important styles always have higher precedence as compared to normal styles. You can read more about specificity calculation in CSS here.